This head’s tranquil demeanor and introspective gaze express what the Yoruba peoples consider a person’s inner power and essential nature. It is a memorial portrait head that comes from the royal city of Ife in western Nigeria, a center of economic, religious, and political power between 1100 and 1400. Ife artists made striking heads in bronze and terra-cotta that were either part of complete figures or, like here, freestanding. 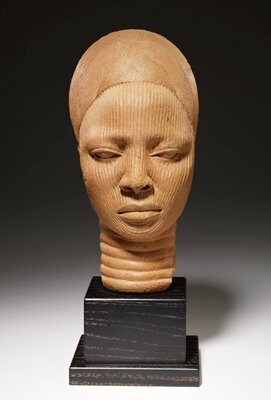 The almond-shaped eyes seem to be encircled by eyeliner, a practice still believed to have empowering properties among contemporary Yoruba, while the neck is creased as though with fat, a sign of prosperity in Yoruba society. The vertical lines covering the woman’s face probably reflect the traditional scarification designs used in the Ife kingdom or may represent the veil worn by the royal family. NewsFlash: Should Damien Hirst have copied an Ife head? Daring to reach new heights?